This pet can be purchased from Conjurer Margoss in Dalaran (Broken Isles). 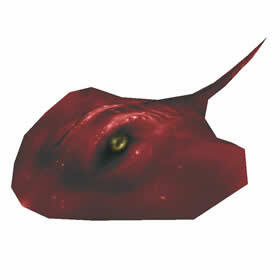 Players must have the Good Friends reputation with Conjurer Margoss in order to buy the Sting Ray Pup. Conjurer Margoss' location can be accessed by using Emblem of Margoss. This item that can be fished up from green pools in Dalaran's Underbelly. Using this item will teleport the player to Margoss - he can be found next to a pond on one of Dalaran's floating islands. Alternatively, players can glide or slow fall from the Pet Battle area in Dalaran to Margoss' location. Upon first meeting Conjurer Margoss, he will have a quest for the player to fish up Drowned Mana from the nearby pond. Completing this quest will reward 250 friendship. Drowned Mana is not only the currency used to purchase the Sting Ray Pup, but can also be turned in to Margoss in exchange for friendship. Each Drowned Mana yields 50 reputation. Occasionally players may fish up Mark of Aquaos. Using this item will spawn a hostile creature, Aquaos. Killing him will turn the small pond into a temporary source of increased Drowned Mana, where successful casts are guaranteed to yield Drowned Mana and sometimes multiple Mana. And... The reputation requirement seems to be gone, as I bought this on the AH today and learned it, I'm at stranger with Margoss. Contrary to the comment below, if you purchase this in the auction house WITHOUT having the necessary rep with Margoss, you will NOT be able to learn the companion. Either way you will need to reach Good Friend status first. However, purchasing in the AH does preclude the need to fish up the additional drowned mana for the actual purchase price of the pet. It can be blue on the auction house because people used a battle-stone upgrade on it before they listed it. You cannot buy any version that is already blue. You can only buy the green version, and then use one of your own battle stones to make it blue before listing it for sale. You can simply buy this from the auction house and learn it without needing any reputation with Margoss. Can you buy this pet from the auction house and equip it if you never earned the rep for it. Ive not seen this answered anywhere here or on wowhead if this is possible? Easiest and fastest way to get pet: join a raid group through customer premade group finder so the Marks of Aquaos show up on a regular basis. (When cast back into the lake it summons an elemental that turns the lake into sparkly mana water - guaranteed drop of drowned mana). I also did this while the darkmoon faire was going, and obtained top hats from the souvenir vendor for a 10% increase in rep for 1 hour. The whole thing probably took about 4 hours. A much more in-depth account dealing with Conjurer Margoss, Drowned Mana, reputation gains, and how to reach his fishing spot can be found here. You'll want to be willing to put in a LOT of time fishing (and like Nat keeps reminding, have a cooler of beer on hand) to get the rep necessary to buy the Sting Ray. Darkmoon Top Hat, that you can buy at Faire for Faire Tickets, is a help with its 10% increase to rep.
Also huge help to find times when there's lots of other folks fishing there, means Aquaos gets summoned often so you're getting a Drowned Mana or two every cast. Otherwise you're lucky to get 15% drop rate. And you need 835 of them. Looking at this pet in my journal, it says its purchased with coins from Nat Pagle in the garrison. Eugh, will check this out and edit appropriately. EDIT he doesn't have the pet.